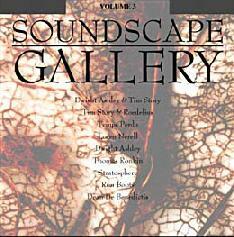 Soundscape Gallery is a series that presents original music by electronic musicians from around the world. Volume 3 offers tracks from Dutch musician Ron Boots, Tim Story, French/German duo Temps Perdu, Loren Nerell, Dwight Ashley, Dean De Benedistis, Stratosphere, Thomas Ronkin, and the great Hans-Joachim Roedelius. The music in the series is typically atmospheric though the first two didn't overly excite me. Volume 3, however, aroused my interest with tracks that are more minimalist and develop in their own simplistic yet interesting ways. Among the highlight tracks are Temps Perdu who offer a deceptively subtle composition. Atmospheric washes fade in and out throughout the piece as the sound of rainfall looms in the background. The liner notes say they combine synthesizers with acoustic world instruments though this track doesn't seem to feature this other instrumentation. Loren Nerell is similar to Temps Perdu. A pulsating drone is the focal point of this piece which is embellished throughout by bells and chants. The drone is like a meditative ohm that allowed me to close my eyes and focus on the music, but not quite relax. Dwight Ashley and Tim Story team up for an atmospheric backdrop embellished by a variety of sounds. The backdrop is like angelic horns or bells and the setting is - depending on the listener - either heaven or space. Dwight Ashley also has a solo track that moves into a spacier realm much like Lektronic artists Spacecraft where much is happening, but in this case it may not all be good. Ashley creates an atmosphere of tension created by carefully placed sounds and musical voices. The liner notes provide good information on the artists and all are uniquely experienced in their field, with their respective fields often venturing into various other media.